After a near-fatal car accident and eventual retirement, Fantastic Negrito returns with a purpose. Friday, Oct. 28, 9 p.m. Fantastic Negrito is the musical persona of Xavier Dphrepaulezz. Raised in a strict Muslim family, he ran away from home at age 12 and never returned. He would fend for himself for the many years that followed, eventually discovering music and learning to play any instrument within arm's reach. In 1995, he scored a deal with Interscope Records and, billed simply as "Xavier," released The X Factor—a funk record in the Prince mold. In spite of good reviews and tours with the Fugees and De La Soul, the record sank without a trace in the pop marketplace. That part of Dphrepaulezz' backstory makes his current success unlikely—and what happened a few years later all but guaranteed he'd never make another record. Earlier this month, I saw him perform at the Asheville Music Hall in Asheville, N.C. Onstage, Dphrepaulezz smiled broadly and told the audience, "Tonight is not a concert; this is group therapy." He went on to share the story of his life's most transformative event: In 1999, the car he was driving was struck by another motorist, and he lay in a coma for weeks. When he awoke, a doctor asked him what he did for a living. "Concerts," he told the physician. "I'm a musician." The doctor told him he would have to find a new career; among many other injuries, his hands were shattered. Dphrepaulezz' live show is even more dynamic and engaging than his studio recordings would suggest. Bum hands be damned, he's an intense guitarist and a commanding presence, a spectacle of nonstop movement and passion, sharing his story. The years following his accident saw him bounce from project to project, including bands (Blood Sugar X, Chocolate Butterfly) and film/television soundtrack contributions (Burn Notice, Blue Mountain State). Eventually, his priorities shifted; he quit music and focused on his family. Years later, at the urging of Empire writer/producer Malcolm Spellman, he re-emerged as a musician, with a renewed sense of purpose. He produced a homemade video that beat more than 7,000 entries to win a spot on NPR's Tiny Desk Concerts. 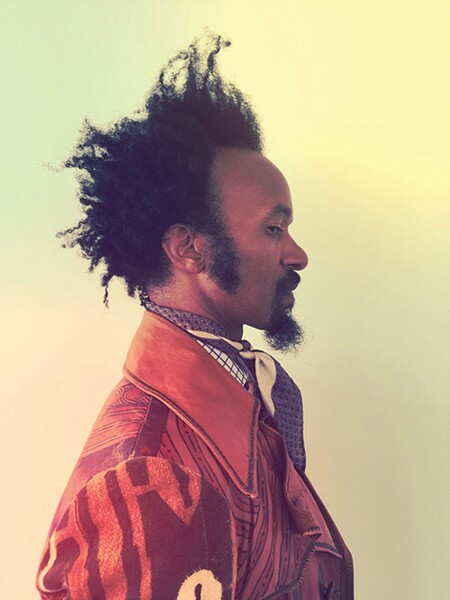 Billing himself as Fantastic Negrito, he premiered new music that went much deeper—both musically and lyrically—than his pre-accident work. While nominally blues or black "roots music," the richly textured songs on The Last Days of Oakland rarely conform to what most people think of as blues. "I was very influenced by all the Delta musicians when I embarked on the idea of Fantastic Negrito," he tells City Weekly in a phone interview. "I love the sense of immediacy, and the urgency." Reviewers draw comparisons to Sly Stone, and Dphrepaulezz name-checks country/roots singer-songwriter Sturgill Simpson, jazz legend Miles Davis and Soundgarden singer Chris Cornell as favorites, too. Dphrepaulezz' songs are more than lyrics set to a beat and melody; evocative tracks like "Working Poor" are a movie for the mind. Moving well beyond themes of love and romance, the songs on the album express and explore Fantastic Negrito's larger concerns. "I wanted [the album] to be meaningful because it is something that is serious," he says. "My intention was to captivate and provoke." In the 1970s, albums routinely included posters, stickers and the like; lavish packages were common. In today's more cost-conscious music business, most of those things are considered luxuries, and are found primarily in the releases of long-established, high-profile artists. Printed lyrics were so important to Dphrepaulezz that he went out-of-pocket to ensure The Last Days of Oakland included them. "You're conveying the message and you're communicating," he says. "What better way to do it than to have the words right in front of the people that you wish to make the connection with?" Juxtaposed with his music, Dphrepaulezz' words, informed by his struggle, make that connection. "At the risk of overusing the word, I feel our purpose here is to contribute to the human family. I know it's a little corny-sounding, but it's something that I really believe in. If I wanted to make money, I would do something else."